Tim Geary mourns at his son's grave. DERRY -- To the hundreds of mourners lining Crystal Avenue yesterday morning, U.S. Marine Lance Cpl. Michael Geary’s death was much more than a sad story. He was one of them. Geary, 20, was killed in combat Dec. 8 while serving with Fox Company 2/9 in Helmand Province, Afghanistan. Friends and family members remembered Geary as a friendly, funny and determined young man who was devoted to his mother, Nancy, and at age 14 knew he wanted to be a Marine. True to his word, Geary was off to boot camp within a month after his 2009 graduation from Pinkerton Academy. On Friday morning, sections of Crystal Avenue were closed to traffic as uniformed Marines, police officers and others silently saluted the funeral procession as it passed under a giant American flag, bearing witness to the hearse carrying Geary’s flag-draped casket. (For more photos from Friday’s cer­emonies, visit: http://www. unionleader. com/ photos/ geary.) During his eulogy, Angus Douglas, Geary’s uncle, expressed gratitude for his nephew’s self-sacrifice as he remembered tidbits of a life cut short. “He was a devoted son, a kind friend and an exemplary Marine,” said Douglas, who noted even though his nephew was never a math whiz or sports star during his high school years, he had the heart of a lion. Douglas said his nephew was a mentor to his many cousins and always had a smile on his face. During his years at Pinkerton Academy, Geary was said to have comforted a sad sophomore classmate with daily “cheer-up” text messages. In his unit, fellow Marines considered Geary a true leader, as well as a mentor for soldiers struggling with deployment. 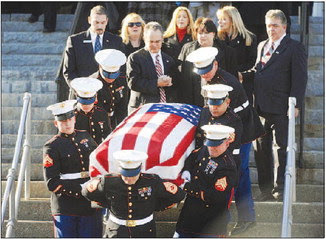 Though Lynch did not know Geary, the governor expressed admiration and gratitude for the young Marine. He urged Geary’s loved ones to continue expressing such courage, not just during life’s challenging moments, but also in their day-to-day lives.